Corsair’s expertise in the closed loop arena is clearly evident from the latest batch of Hydro series coolers – through the generations of coolers many aspects have been refined and along with its counterparts, the H80i GT is an impressive product. Observing the likeness to the older H80 and new H80i GT will identify how far Corsair has come. The styling and build quality on the GT is definitely notable. The radiator looks and feels like a quality piece of kit with its gun metal accent plates and the new nylon/woven tubing. The attention to detail on H80i GT is encouraging to see. Being able to install this cooler in next to no time is another highlight. 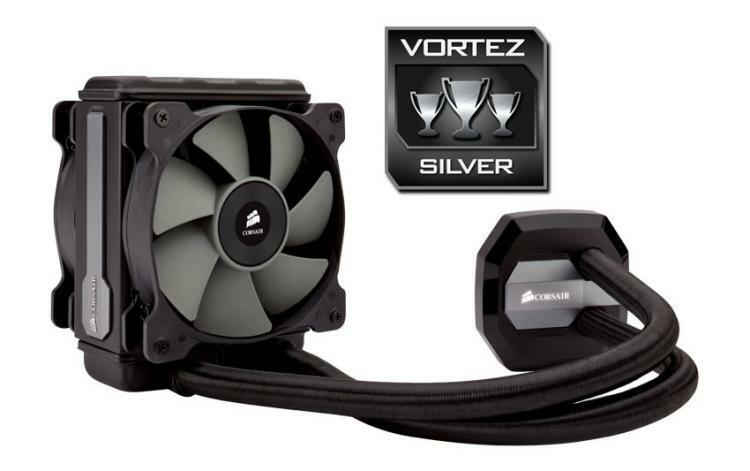 There are very few steps involved in attaching this closed loop to your system and inside your case and the obvious benefits are there for clearance around the socket – though when using an X99 motherboard, tall memory kits do have a slight limitation due to the extension of the radiator/fans. On the performance front the H80i GT delivers good results. Using the cooler in default (PWM) mode will give lower noise and still attain decent results but if a significant overclock is required, it’s necessary to use a different profile – perhaps choosing performance or even a defined RPM preset. Adjusting the cooling fans to 100% offered up some impressive results and certainly shows H80i GT’s valuable position as an alternative to investing in a flagship air cooler. Costing £81 GBP / $105 USD, H80i GT isn’t a cheap investment but nor does it scrimp on features either. Included are two 120mm cooling fans and of course the added bonus of being digital – allowing the user to fully control noise, performance and lighting. The Hydro Series H80i GT is another compelling release from Corsair. Styling has almost certainly been refined and on offer is closed loop which packs in plenty of features and performs well.